Here, in one volume, is everything you need to know to ensure the good health, long life, glossy coat, bright eyes, strong bones, alert intelligence, and calm disposition of your furred and feathered companions, from choosing and training your pet to enhancing its life with diet and natural therapies. In this revised edition of her groundbreaking work, CJ Puotinen gives animal lovers even more of the information they'll need to care for their dogs, cats, birds, and rabbits the natural way. "This handy guide serves as a wonderful springboard for anyone already interested in natural or alternative medicine for pets as well as an introduction for the general animal lover…What a cornucopia of resources!" 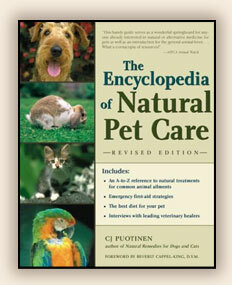 CJ Puotinen is the author of many books on natural health, including Natural Remedies for Dogs and Cats.